We deserve a Supreme Court justice who will respect the rights of workers and who will enforce decades of legal precedent that protect us in the workplace. On Monday night, President Donald Trump rejected working men and women by selecting Judge Brett Kavanaugh to fill the vacancy created by Justice Anthony Kennedy’s retirement. In Venetian Casino Resort LLC v. NLRB, he sided with the casino after an NLRB decision held that the hotel engaged in unfair labor practices by requesting that police officers issue criminal citations against legal protesters. 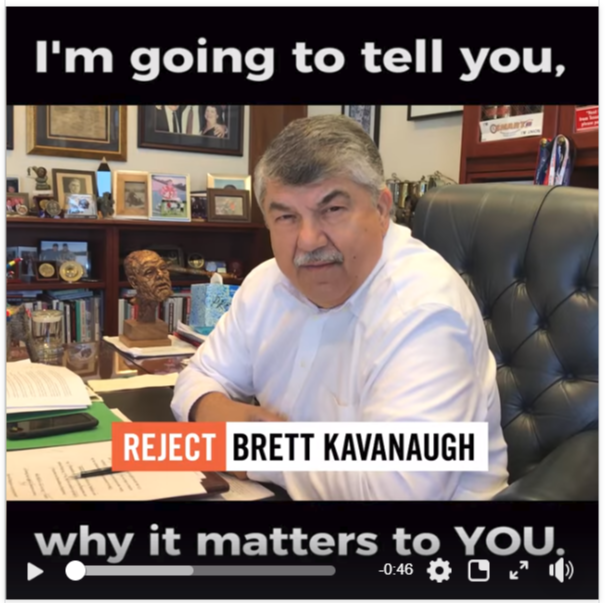 Update your profile picture now, stand with working people and reject Judge Brett Kavanaugh. The November ballot is starting to take shape as backers of controversial initiative petitions turned in signatures last week. If enough signatures are verified, they will appear as ballot measures on the November ballot. Backed by anti-choice extremists, it would reduce access to abortion by eliminating funding for abortion and women’s healthcare for people on Medicaid and public employees. Repeals 30-year-old sanctuary state law. Backed by a known hate group, it would increase racial profiling, harm immigrant communities, and jeopardize public safety. Requires publicly traded corporations to provide to the Secretary of State a public report of their Oregon taxes. This petition will not appear on the November ballot. Here’s why. Would make it harder to eliminate tax loopholes or hold corporations and the wealthy accountable for paying their fair share. Tax carve out for corporations like Walmart who want to avoid paying their fair share. Blocks the ability of voters and local governments to make their own decisions about local issues and address public health crises. Join fellow union members for a fun, union-wide gathering consisting of craft beers, delicious complimentary taco bar and lively conversation! These days, we need keep a strong bond of solidarity throughout all of our locals. That's what these evenings are all about! 100% of proceeds go to Labor’s Community Services Agency. As recent events in Oregon and across the nation confirm, the fighting spirit of the union movement is alive and well. Please join us for a weekend of exciting classes and thoughtful discussion that will help you develop your leadership skills and become part of launching a new era in Oregon unionism.